It was some time ago now when I was invited down to the Pixi Beauty's pop up shop in London's Covent Garden for a browse at all the latest releases and swoon at the cabinet stocked with the infamous Pixi Glow Tonic. I was lucky enough to come home with a few products from their skincare range and choose two hydrating options. One of the misconceptions about skincare is the difference between dry and dehydrated skin, and I know before I became immersed in beauty blogging I was ignorant to the difference. My skin is generally 'normal' veering towards oily in the Summer or dry in the Winter and my skincare regime keeps things in check on a day to day basis. But I am also a smoker, one of the top causes for dehydrated skin, throw in my age and a hangover or two and there are days when my skin is crying out for moisture. To help combat my dehydrated skin I chose Pixi Hydrating Milky Serum* and Pixi Hydrating Milky Mist*. Pixi Hydrating Milky Serum is a godsend the morning after the night before when I my skin is giving away my previous nights excesses and I need to start with the basics before piling on the make up. It's not unusual for me to fall into bed without so much as a wipe passing my face after a night out so it's action stations come the morning to repair the damage. The serum is used after cleansing and toning and will instantly make skin look plumper and fresher than I feel thanks to it's formula packed with nutrients. A side note on the packaging, whilst it's an attractive looking bottle which comes with both a cap or a pipette, I've found the pipette doesn't work well. The liquid is a thin gel texture so I find the pipette only works to 'scoop' it and swipe on my hand, rather than piping but it's a minor gripe and it works for me. Having a cap means you can easily travel with this product but it would mean having to remember your pipette and if you're anything like me you will have lost the cap long ago. 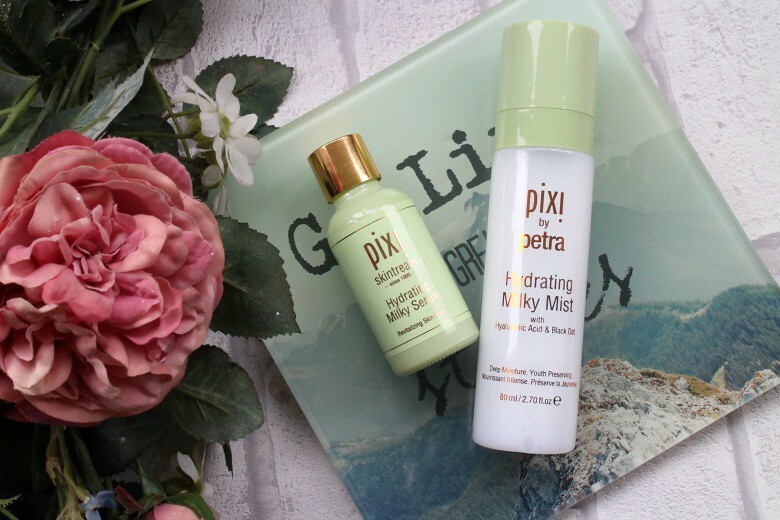 I'd seen the Pixi Hydrating Milky Mist mentioned on one or two blogs so it was a perfect accompaniment to the serum. I'm on the fence about these mists, on one hand I enjoy using them and on the other I'm wondering is it not just a vanity product. Either way I'm nearing the end of this bottle so I'm enjoying using it on a regular basis and it does contain one of my 'favourite' products, Hyaluronic Acid so it feels like it's doing much more than other mists and sprays. Typically I'll apply this fine mist, and it really is a fine mist, as a toning step but there have been occasions, especially recent weeks when the temperatures have soared and I've wanted to cool off. It's physical size doesn't make it ideal for travel and I'm less inclined to put in my handbag which is a shame as it's be perfect for flights (whilst under the 100ml size it'd be a battle storing in one of those plastic bags) or to refresh make up before a night out. Can we have a travel size please Pixi? I don't find that Pixi skincare is necessarily the 'strongest' of products for my mature skin but I can't fault those I have tried for doing the job of hydrating my skin and welcome them in my skincare collection. For instant results when there is no time for a hydrating mask or pamper evening these are reliable products I can reach for. What products do you reach for when you need some quick hydration?